Gaze out at the extraordinary city of Dubai from the tallest building in the world, the Burj Khalifa. Zoom up to the awe-inspiring 124th and125th floor of the Burj Khalifa in the world's fastest elevator. Stand on the observation deck and enjoy 360-degree views of the city and the Arabian Gulf as the sun sets. Look down at the ant-like people roaming about the Boardwalk and enjoy your distinct view of the Dubai Fountain. A view from the tallest building in the world sounds like quite the experience, and that's exactly what you can expect with this voucher! Enjoy a fascinating multimedia presentation about Dubai's history and its crown jewel, the Burj, as you make your way to the 124th floor. Once there, you can enjoy mesmerising views of modern Dubai's landscape. Amazing vistas of Dubai await you as you step on to the 124th floor, aided by the viewing telescopes that dot the observation deck to enhance your view and your experience even further. The floor-to-ceiling glass walls provide an amazing panoramic view of the city, desert, and ocean from a height of 452 meters! Your voucher gives you access to the 125th floor as well. You could also choose to step onto the open-air terrace and observation decks to get a clearer view through the viewing telescopes that have been set up here. Step out onto the open-air terrace to take in the unparalleled sights of the city and beyond. You can also browse and pick up unique souvenirs at the shops during your visit. With these Burj Khalifa tickets, you will be able to skip the long ticket queue and head straight to the elevator line that will zip you to the 124th & 125th floor. This elevator is also the fastest elevator in the world. Should you wish to skip the ticketing line as well as the elevator line, you can purchase Skip the Line tickets to the 124th and 125th floor by clicking here. Admission tickets to 124th and 125th Floor of the Burj Khalifa. 10% Discount at the souvenir shops of the attraction. 10% Discount at "The Cafe", located on the ground floor of the attraction. Use of the viewing telescopes on the observation deck. Multilingual smart audio guide in English, Arabic, French, Spanish, Mandarin, Japanese, Russian and German (available for 25 AED at the ticket counter). Please be aware that we may experience some delays as some locations can be unavoidably busy and some lines could form at mandatory security checks and at entrances for the stairs and the elevator. Due to its popularity, you might have to wait anywhere between 15 to 30 minutes at the elevator queue. We recommend allowing extra time before your next activity to ensure you make the most of your Burj Khalifa At the Top experience. Entry to the Burj Khalifa is timed. You can only enter at the timeslot you choose at the time of the booking. However, once you're inside, you can stay for as long as you like. People on average spend 40-45 minutes at the observatory. Burj Khalifa At the Top is open from 8:30 AM to 11:00 PM and tickets are available for timeslots every 30 minutes. The best time to visit At the Top is during the sunset hours when an amber glow spans across the sky. The sunset hours between 4:30 PM - 6:00 PM giving you the best chance to enjoy stunning evening views of the Dubai skyline! Tickets for prime hours (sunset time) are costlier than non-prime hours (rest of the day). For the sunrise timings (between 5:30 - 8:30 AM), along with the general admission ticket, you will also get a complimentary Signature Treat, Pastry of the Day and one capuccino at The Cafe in the Burj Khalifa. Children below the age of 3 enter for free. Child tickets (3-12 years of age) are available at a reduced price of AED 100. Please ensure that you are carrying a valid ID of the members in your group if you select any reduced price tickets during checkout. The Burj Khalifa/Dubai Mall metro stop is a 9-minute walk from the Burj Khalifa. You will receive an email with your Burj Khalifa: At the Top (Level 124 & 125) voucher shortly. You need not take a print out. Please download and display the voucher on your mobile phone at the ticketing counter at the meeting point to collect your physical tickets. Ground Floor of Dubai Mall. Enter the Burj Khalifa via the Dubai Mall, Lower Ground Level. 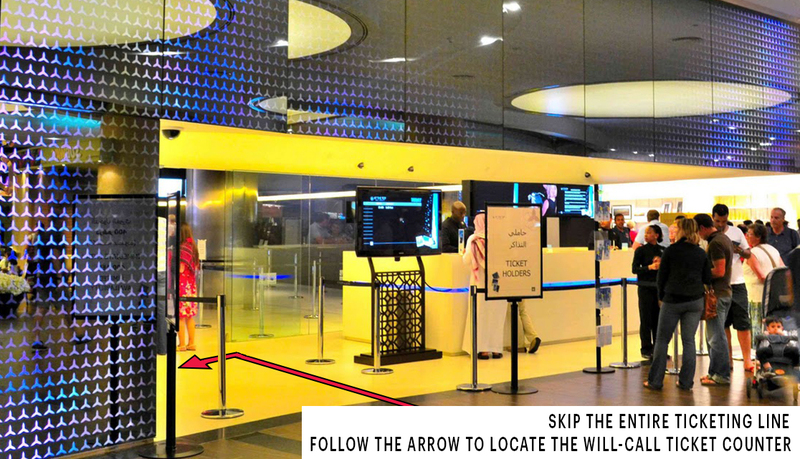 Display the voucher at the will-call ticket counter located at the At The Top entrance on the lower ground level of the Dubai Mall.